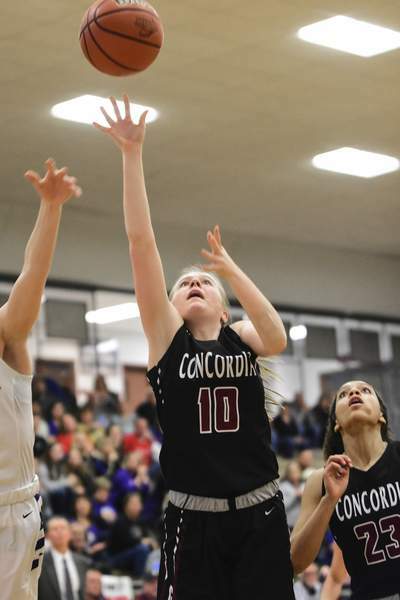 Mike Moore | The Journal Gazette Concordia Lutheran sophomore Rhaya Kaschinske scores under the basket in the fourth quarter against Angola during the Girls IHSAA Class 3A Sectional Championship at Concordia on Monday. 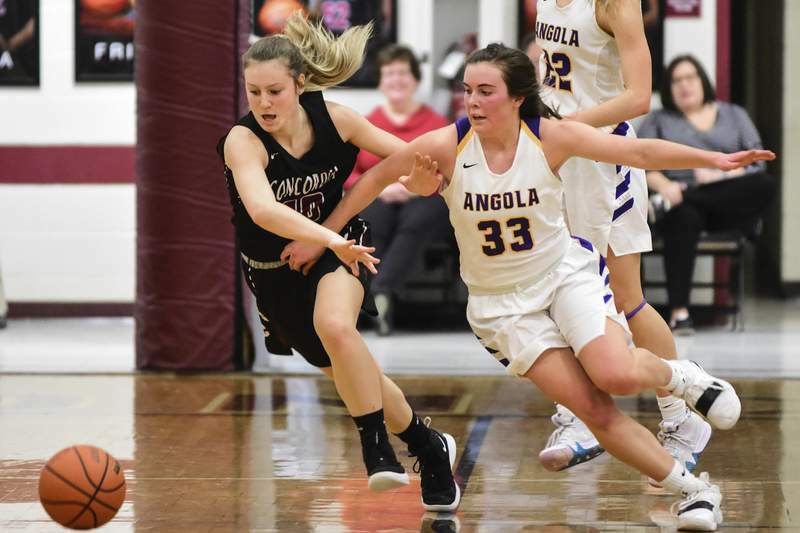 Mike Moore | The Journal Gazette Angola sophomore Hanna Knoll, right reaches in to steal the ball from Concordia Lutheran senior Carissa Garcia in the forth quarter of the Girls IHSAA Class 3A Sectional Championship at Concordia on Monday. 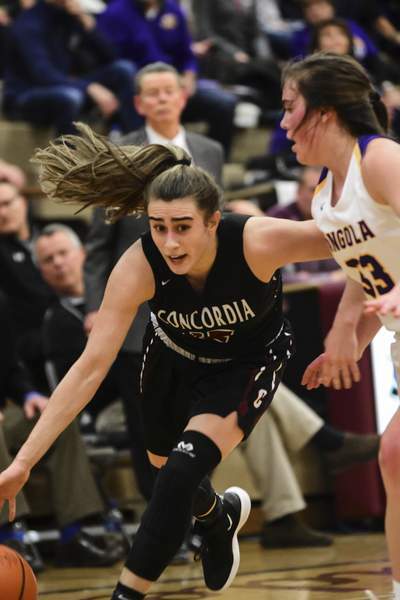 Mike Moore | The Journal Gazette Concordia Lutheran senior Carissa Garcia drives to the basket in the fourth quarter against Angola during the Girls IHSAA Class 3A Sectional Championship at Concordia on Monday. 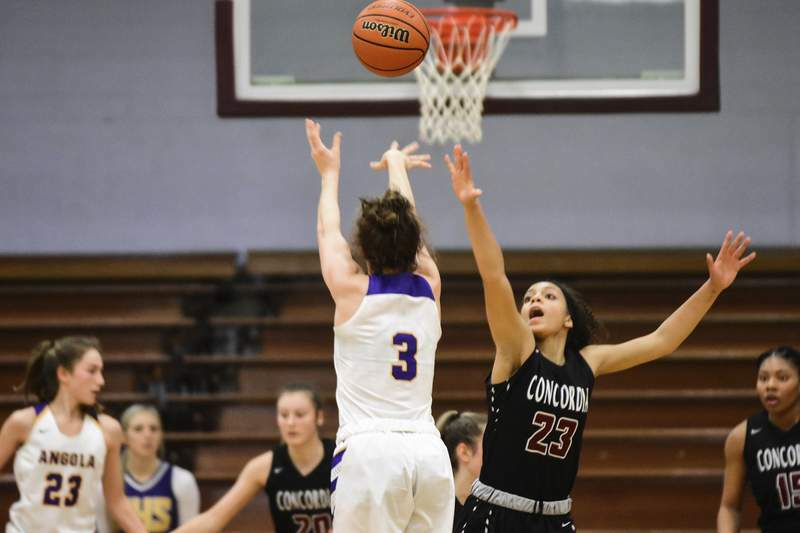 Mike Moore | The Journal Gazette Concordia Lutheran sophomore Cierra Calloway tries to block a shot taken by Angola sophomore Hanna Knoll in the forth quarter of the Girls IHSAA Class 3A Sectional Championship at Concordia on Monday. 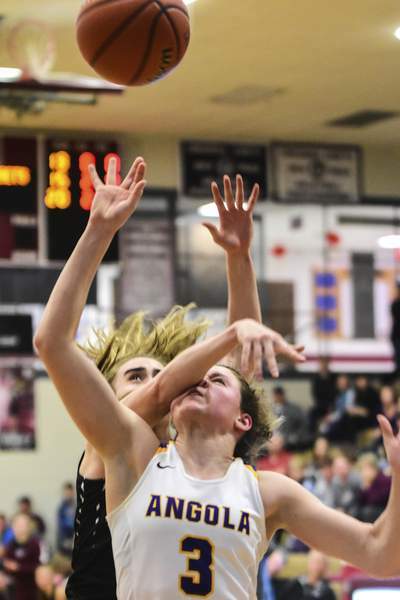 Mike Moore | The Journal Gazette Angola sophomore Hanna Knoll takes an elbow to the face from Concordia Lutheran senior Carissa Garcia in the forth quarter of the Girls IHSAA Class 3A Sectional Championship at Concordia on Monday. 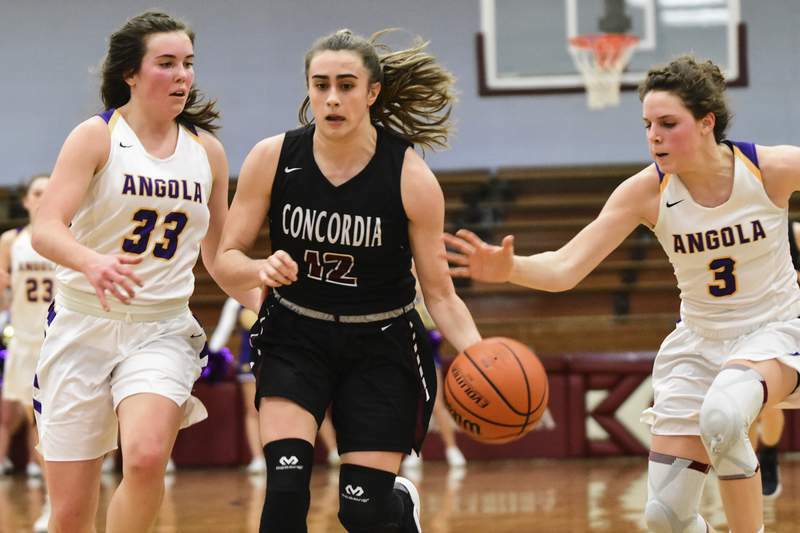 Mike Moore | The Journal Gazette Angola senior Reace Peppler drives to the basket in the second quarter against Concordia Lutheran during the Girls IHSAA Class 3A Sectional Championship at Concordia on Monday. Mike Moore | The Journal Gazette Concordia Lutheran senior Carissa Garcia, left and Angola defenders Kayla Fenstermal, center and Lauren Leach, right wait on a call after fighting for possession in a tie-up in the forth quarter of the Girls IHSAA Class 3A Sectional Championship at Concordia on Monday. 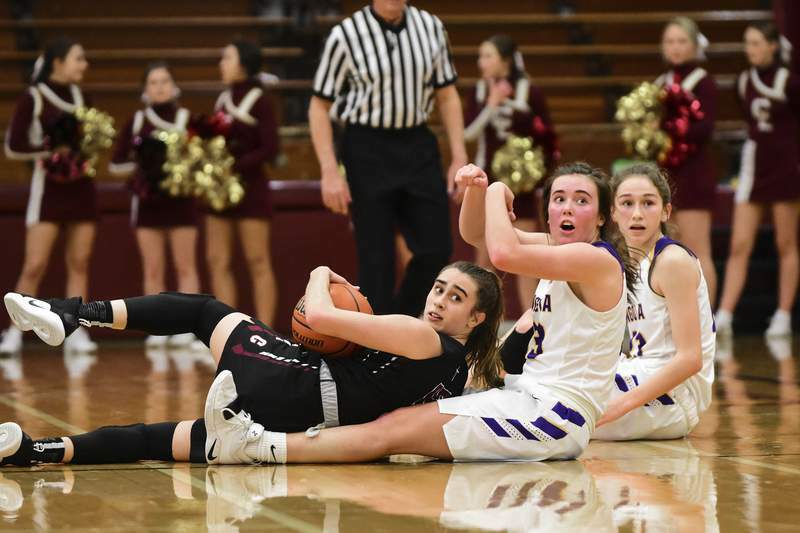 Mike Moore | The Journal Gazette Concordia Lutheran sophomore Meg Barkley, left and Angola junior Kayla Fenstermal fight for a loose ball in the third quarter of the Girls IHSAA Class 3A Sectional Championship at Concordia on Monday. 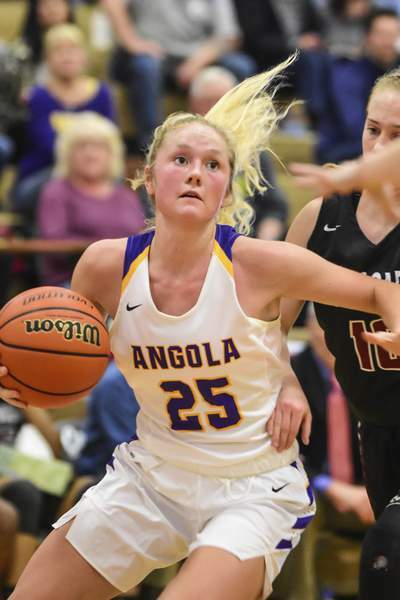 Angola plays Concordia Lutheran for the Girls IHSAA 3A Sectional Basketball Championship at Concordia on Monday.